the history and current projects on the Monument. to reserved one of the 80 seats per session. and the coming of Americans to the West. At the Dunford Auditorium on the Dixie State University campus. laboratory the Monument is and new and exciting discoveries. of the Old Spanish Trail Association bi-monthly meeting. then straight west from just south of Castle Cliffs toward the Muddy River. carrying all of the water man and animals needed to get to the Muddy River. habitation on Mt. Trumbull and the Arizona Strip. and the early settlements in the county. Based on Chapter 2 of Dr. Alder's History of Washington County book. Dixie Four Wheel Drive will have answers and suggestions. Subject: Sinking Roots, Stability and Isolation. Based on Chapters 3 & 4 of Dr. Alder's History of Washington County book. University of Utah, Mayor of Salt Lake City and world renown Climbing Bum. The subject will be the Mountain Meadows Massacre. of the BLM asked him to prepare on wild horse and burrow populations. knowledgeable about the Arizona Strip. that helped to connect the West during the Mining era! eventually to Dixie from there. Knowing Leo and Sharlene, it will be fun to hear what they have to say. restoration of the Paria movie set, and the history of Kanab. Let's got looking for oil in the pages of history. that killed 10 people on March 6, 1935. Sites are an easy walk from car access. Subject: Stories, Reflections, Cultural Life. Based on Chapters 5 & 6 of Dr. Alder's History of Washington County book. Latimer Smith is the past president of The Grand Canyon Boatmen Association. Latimer grew up in two places, Kanab Utah and in the Grand Canyon. in the United States especially the Grand Canyon. "A Place for Everything: The Organization of Activities in the Prehistoric World"
that could have demographic, social, or religious reasons and implications. over time in order to explore the implications of architectural change. This lecture will be held at the Canyon Community Center, 126 Lion Boulevard, Springdale. Based on Chapter 7 of Dr. Alder's History of Washington County book. you get the most out of visiting local archeology sites. will discuss the museum and the town of Silver Reef. 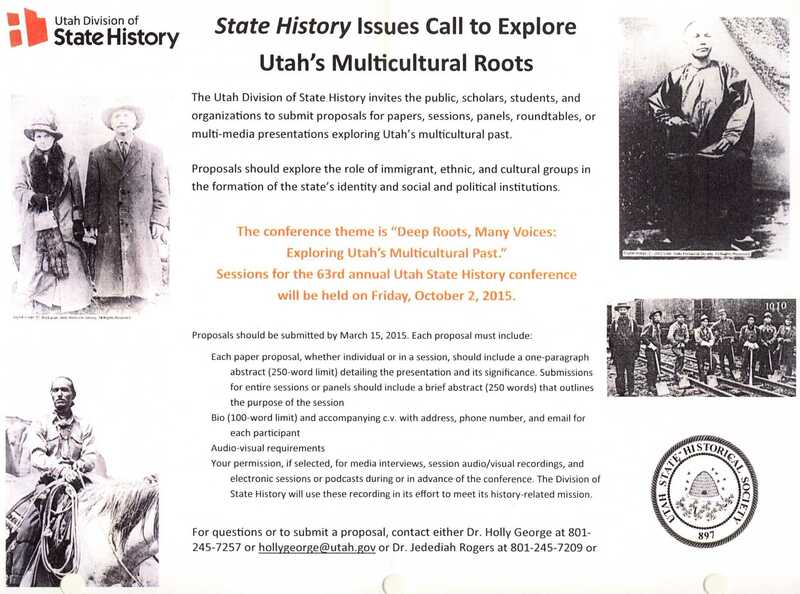 Theme: "Deep Roots, Many Voices: Exploring Utah's Multicultural Past". The conference will be held 10/2/2015 in Salt Lake. For the call for papers, click here. Based on Chapters 8 & 9 of Dr. Alder's History of Washington County book. and a little about them. It should be very interesting and informative too. will discuss plants and ecology of our area. Meet at the south parking lot of the Dixie Convention Center on south Convention Center Drive. Look for the group forming at the far south end of the parking lot. From there we will make our way due south to the St George City Confluence Park. Bring hat, sun screen, and water. Based on Chapter 10 of Dr. Alder's History of Washington County book. This program is free, dress is casual, and everyone in invited. are available at the Tabernacle west entrance. on the society's goals and current projects. Based on Chapter 11 of Dr. Alder's History of Washington County book. of Western North American and Australian rock art. At the historic Cosmopolitan Restaurant building in Silver Reef. while Cloe was wintering cattle in Whitmore Canyon. Based on Chapters 12 & 13 of Dr. Alder's History of Washington County book. Ranger, will discuss OHV regulations on the Monument and the Arizona Strip. Subject: This will be the last session of this class. a big game hunter and is knowledgeable on big game on The Strip. from 11:00 am to 1:00 pm in the basement of the Santa Clara Town Hall. available on Little League Drive. Pipe Spring National Monument, and Cedar Breaks National Monument. Attendance is free and you can come and go as you please. (D/ASIA) and see what a diverse group they are. Silver Reef talk by Mike Empey: "Stories from the Rockpile"
into everyday life during the early days at "The Rockpile". The talk will start at 10:00 am in the old Cosmopolitan Restaurant. The program is free but a donation of $2.00 would be appreciated. Eighteen historic sycamores on Santa Clara Drive! Learn the fascinating history of our community's trees. Free: trees, food, fun, games, and face painting. the inaugural musical event in this newly renovated hall. for the Virgin Heritage Square. South Mill Street, Virgin, Utah. Suggested donation is $10 per person or $15 per family. or call Marcia Whitney at (435)656-6360 ext 7204. George Staheli with the Washington City Historical Society at (435)673-3085. Sally & Orval Bundy will reminess and answer questions about the school. Sally taught there (eight grades in one room). Orval attended school there and still ranches in the area. Reservations are required and the cost is $10.00 per person which includes lunch. graded dirt & gravel. High clearance vehicles are recommended. Saturday, 5/9/2015, 9:00 am - ??? away, at Modena you got your ticket to anywhere that mattered. Anyone is welcome to come along. This should be a very interesting trip. on the archaeological work on the site and the history of Silver Reef. Reservations are required and there is a suggested donation of $2 per person. Contact the Silver Reef Museum at Museum@SilverReef.org or (435)879-2254. Meet for the walk at the Silver Reef Museum. 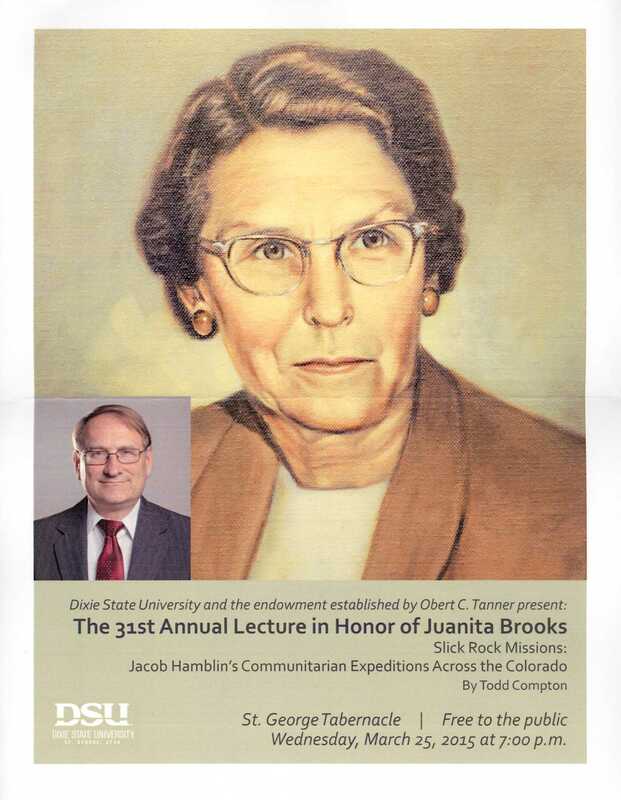 The lecture will be at the Cosmopolitan. Early Swiss pioneers brough the art of paper-cutting to Santa Clara. This activity is free and open to the public. At the Santa Clara Town Hall, 2603 Santa Clara Drive in Santa Clara. Arizona Historic Preservation Conference: "Paths to Preservation"
For more information, see the conference website, http://azpreservation.com. Southern Utah, 1849-50", will speak on that subject; then travel over some of the trails with him. Parts of the tour will require 4-wheel drive vehicles, but those sections can be bypassed. There will be other OSTA members attending from Sevier, Wayne, and Emery counties. Meet at the LDS Church in Orderville. Sunday clothing not expected as long as what we wear is clean. petroglyphs in Santa Clara on Land Hill. If you go you will learn a lot! tell some of the stories about the place. Reservations are required with a $10.00 fee which will include lunch. For details, click here for the flyer. Silver Reef talk by Gary Dixon: "Custer's Last Stand"
Dixon will talk about Custer's stand at the Little Bighorm. The program is free but a donation of $2.00 is suggested. the Silver Reef Museum at (435)879-2254 or Museum@SilverReef.org. followed by a telescope viewing of the night sky. women and children in 1866, during the Black Hawk War. All who are interested are welcome to attend. At the L.D.S. Chapel in Circleville. Clean every-day clothes are acceptable. on Circleville Mountain at the end of 1849. (those finishing this will get on Interstate 15 at exit 100). for non-members' accidents on the tour. with Fred Pendleton sharing the history of each site. Bring lawn chairs or blankets for picnicking. This family oriented event will include an introduction to the historic trails of Southern Utah. free campfire weenie roasting/marshmallow toasting for children under the age of 12.
on Highway 56, and then north along the Iron County Land Fill road for 3 miles. This is one of the last remaining lookouts in the country. Jerry Empey, who spent several years working there, will lead the group. D/ASIA will provide a lunch for $10. This trip will be limited to 25 people with priority given to D/ASIA members. High clearance vehicles are required (no cars or vans). Reservations can be made at the Information Center or by calling (435)688-3200. There are a variety of vendors and information booths that make it well worth the visit. The parade takes place on Saturday. Mayor Bracken will lead the walk and you can also enjoy the Cornfest that day. Meet at the parking lot behind LDS Church, 50 South Center Street in Enterprise. Mayor Bramell will lead the walk and you can also enjoy the Peach Days activities. Meet at the Hurricane Community Center, 63 South 100 West in Hurricane. Bubble Cannon; History Lecture; Shootout; Vendors; and More. and Paxman families, who are their ancestors that helped settle Washington. Mayor Hart will lead the walk and you can also enjoy the Heritage Days activities. Meet at the Ivins City Park, 100 North Main in Ivins. We will visit the site of and learn about one of the first murders in the county. with the sheriff. Other historical sites in Toquerville will also be visited. 63 N. Toquerville Blvd., Toquerville. Mayor Rosenberg will lead the walk and you can also enjoy the Swiss Days activities. Meet at the City Hall, 2603 Santa Clara Drive (East Grounds) in Santa Clara. Location and further information TBD. Mayor Pike will lead the walk and you can also enjoy the St. George Marathon. Meet at the Sandtown (Bluff Street) Park Gazebo, 600 North Bluff Street in St. George. St. George, and talk about his book, "A Little Piece of Zion: The St. George Town Lot." There will be time after the presentation for a few questions. history of this area this is your chance. Be prepared to be informed and entertained. 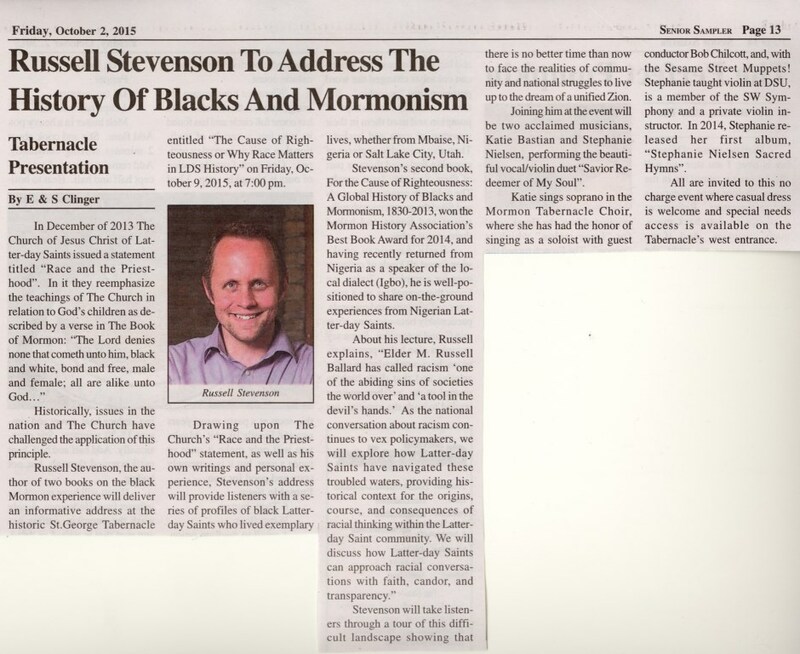 Subject: "The Cause of Righteousness or Why Race Matters in LDS History"
by Russell Stevenson. For details on this program, click here. This event is free, but with fund-raising options for the New Harmony Volunteer Fire Department. 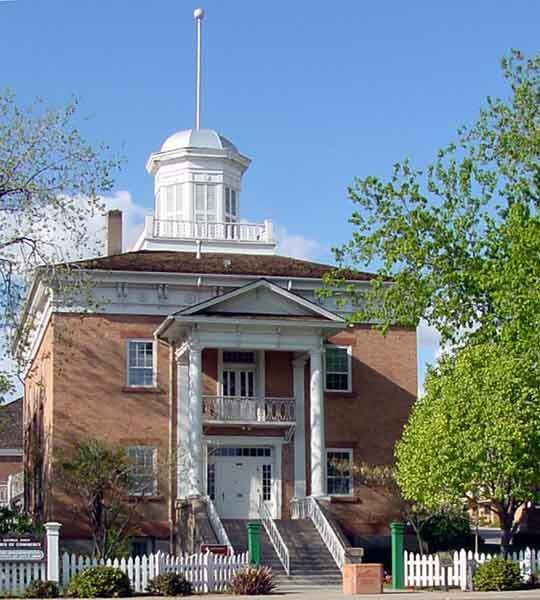 While there, take the opportunity to visit the historic sites in New Harmony. Al Matheson will lead a free car tour of Spanish Trail sites in Iron County. and will end at Iron Springs for the chuck wagon dinner (see below). In addition to the dinner, there will be buggy and wagon rides available. but it is not necessary to take the car tour to participate in the dinner. $15; Reservations are due by Thursday, October 8. Lenny Wilcox Brinkerhoff will talk about her ancestor, John. D. Lee. She will also talk a little bit about Mountain Meadow. Thursday, 10/22/2015, 9:00 am - ??? Gooseberry Mesa, the Grafton Cemetery, Grafton (lunch), and the old Grafton Bridge. The evening will begin with live entertainment. There will be a silent auction. And a good dinner will be included with the $20 admission. Ron Romney at (435)627-9587, or Kelly Paxman at (435)673-5256. Silver Reef over 125 years ago. Light refreshments will be served. Patron, Sponsor, and Life Time members can bring up to two guests free. For reservations contact the Museum at Museum@SilverReef.org or call (435)879-2254. This presentation will be similar to the 7:00 pm one, but indoors with seating. Meet at the Silver Reef Museum. Bring a flashlight or lantern. Arrive 15 minutes early to park and pay. Snow Canyon State Park staff on the attractions and programs offered in the Park. their lives and stories, interwoven with original music about these same stories. about early life on Mt. Trumbull and the Arizona Strip. This year's theme is "Celebrating Early Homesteading and Settlements across the Arizona Strip. per person and includes a roast beef buffet. At the Sun River Community Center Ballroom. will talk about her work. their way into the history books. 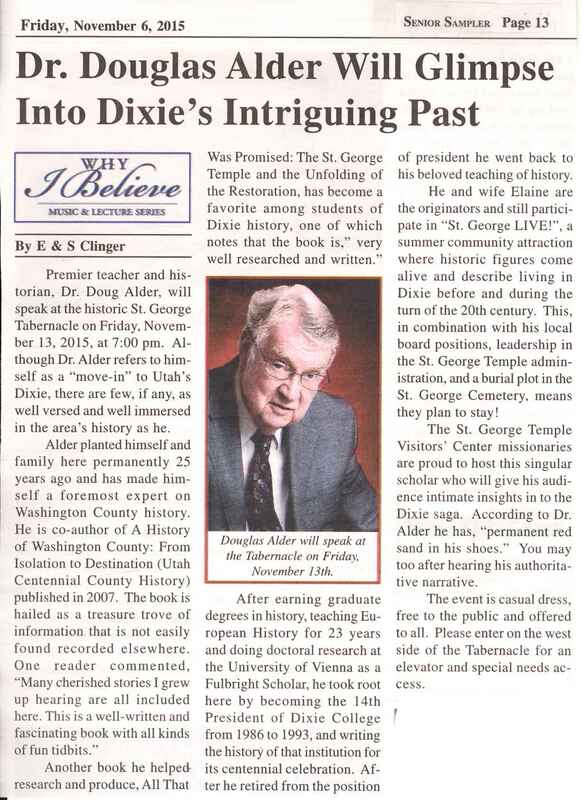 Dr. Douglas Alder will give a glimpse into Dixie's intriguing past. This respected scholar will provide intimate insights into the Dixie saga. For the an article about this talk, click here. Geologist, Marc Deshowitz, will speak on "Geopsychology of the Silver Reef, Leeds, Utah"
There is a suggested donation of $4.00 and reservations are preferred but not required. Dorinda Slade who settled in Pine Valley. David Lee will speak on rock art here and throughout the world. Mayor Peterson will lead the walk. Meet at TBD in Leeds. brought this park into being will be coming with us that day and giving us the history of the area. This field trip is open to anyone and there is no charge. Participants who wish to carpool from St. George will meet at 9 am in the parking lot of the BLM. Regional Confluence Park. The trail head is just south of the Coffee Shop parking lot. For a more detailed article, click here. will explain the Institute and its many programs available to area residents. This is a phenomenal resource in the community and not to be missed. Mayor Gubler will lead the walk and you can also enjoy Winter Fest that day. Meet at LaVerkin Elementary School, 51 West Center Street in LaVerkin. 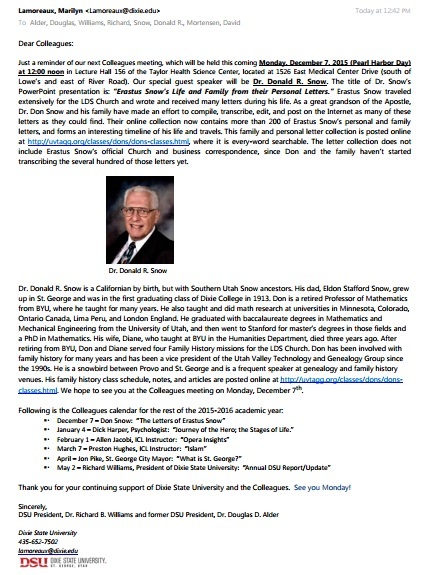 Don Snow, a grandson of Erastus Snow, will speak on "The Letters of Erastus Snow". Thursday, 12/10/2015, ?:?? am - ??? will discuss the history of the Band and upcoming projects on the reservation. This is a D/ASIA tradition at Christmas. Come prepared to participate. wagon. Come for this special holiday event unlike any other in the southwest! Gates open at 5:00 pm MST. A $7 monument use fee for adults 15 and older will apply. See the Pipe Spring website for driving directions.